The apartment-room has almost everything, fully equipped little kitchenette, room was super clean, and bed was comfy, despite being on the small size. Smart design where bed is pulled up and voila! bedroom becomes a couch and living area. Staff accommodated all our needs, including having to extend our stay 4 more days. The front desk customer service was excellent. The lady in charge of the breakfast was attentive and caring. Room was very nice with all the necessities including a kitchenette. Washroom facility was also very nice. Location was very good. Just 15 mins walk from Eifell tower and 10 mins walk from arc de triumph. The beds were comfy and the staff was extremely friendly and accommodating. The location was great and centralized enough to give us easy access to most of the sights and activities we wanted to do while there. The location is good about about 10 mins waiting to the Trocadero. Perfect location close to the Eiffel Tower and Metro. Clean, modern and well appointed. Quality remodel. Attractive. Well stocked kitchen. Nice location walking distance to major attractions. Clean and nice staff. 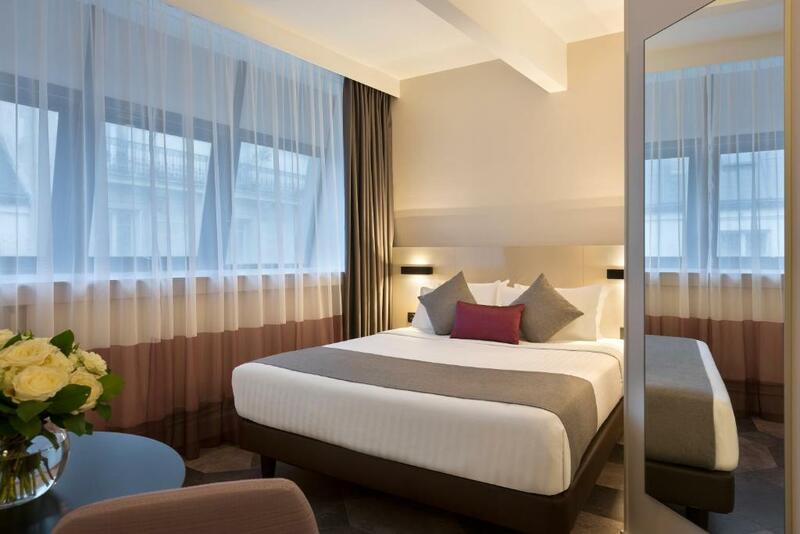 Lock in a great price for Citadines Trocadéro Paris – rated 8.3 by recent guests! 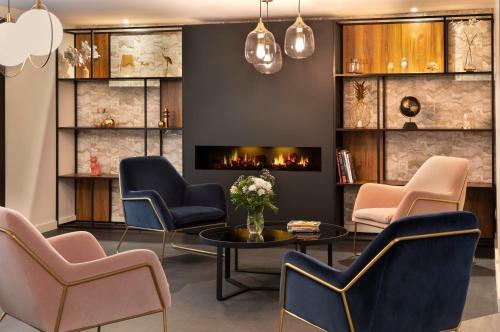 One of our top picks in Paris.The Citadines Trocadéro Paris is located 1,650 feet away Trocadéro Metro Station, which leads directly to the Champs-Élysées and Galeries Lafayette department store. It offers fully equipped apartments and free WiFi. 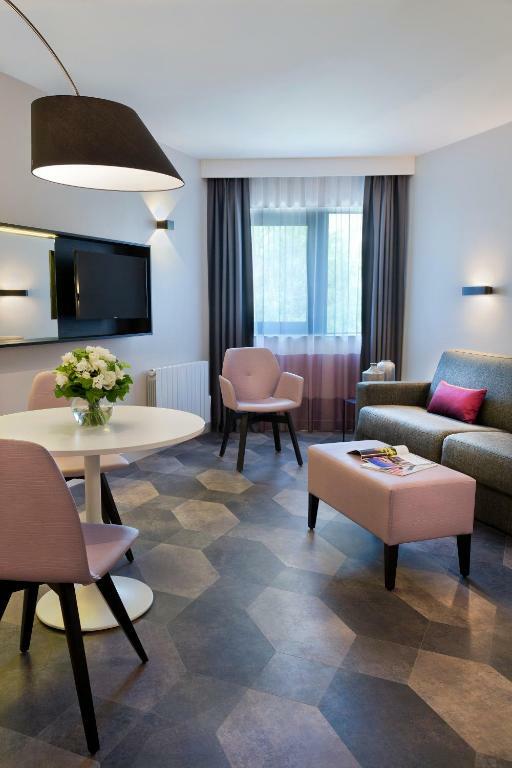 The studios and apartments at the Citadines Trocadéro Paris are air-conditioned and include a kitchen and a seating area equipped with a TV with satellite channels. The larger apartments also have a dishwasher. 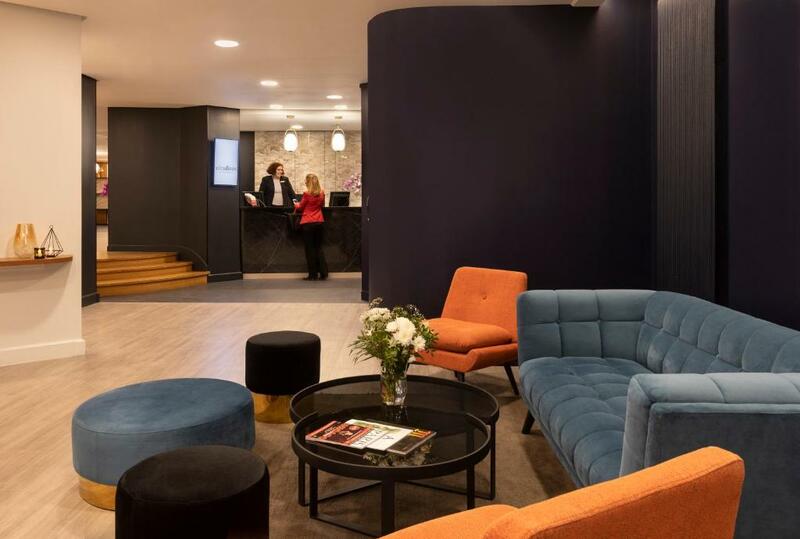 Guests at the Citadines Trocadéro Paris have access to additional services such as laundry, breakfast, an on-site car park and business center. The property is a 15-minute walk from the Museum of Modern Art. These self-catering apartments are a 20-minute walk from the Musée du Quai Branly. When would you like to stay at Citadines Trocadéro Paris? This air-conditioned studio features an private bathroom, a sofa bed and fully-equipped kitchen. It also features free WiFi and a flat-screen TV with satellite channels. Full weekly housekeeping is included in the price. This air-conditioned apartment offers a kitchen, free WiFi access and a flat-screen TV with satellite channels. A private bathroom is available and the bedroom includes 1 double bed or 2 single beds. Full weekly housekeeping are included in the price. This air-conditioned apartment has a seating area, a private bathroom and an electric kettle. Free WiFi, a telephone and a flat-screen TV with satellite channels are also featured in this apartment. The bedroom features 2 single beds or 1 double bed. Apart’hotel Citadines Trocadéro Paris welcomes you to the 16th district, one of the city’s most prestigious, a stone’s throw from the Eiffel Tower. Its many public gardens make the district particularly welcoming and enjoyable to live in. It is a pleasure to stroll along the avenues that lead to some of Paris’ most famous attractions, such as the Guimet museum, the Paris Aquarium, and the Museum of Man. Here and there, cross over the Seine, going from one bridge to another, and soak up the authentic charm of Paris. Apart’hotel Citadines Trocadéro Paris offers you fully equipped serviced apartments, for a short stay or extended visit to the capital. From studios for two people to three-room apartments able to accommodate up to six occupants, all include modern fitted kitchens and air conditioning. Whether you are on holiday or a business trip, enjoy relaxing in the inner garden or on one of the many terraces of our serviced apartments hotel. House Rules Citadines Trocadéro Paris takes special requests – add in the next step! Citadines Trocadéro Paris accepts these cards and reserves the right to temporarily hold an amount prior to arrival. Please note that the credit card used to make the reservation will be required upon check-in. The staff is friendly and nearby Eiffel Tower. We stayed 6 nights and we only had 1 make up room. The one time the housekeeping cleaned our room, My sons favorite security stuff toy turle went missing. He knew it as soon as he went to his bed. He left 2 of his turtle on top of the bed before we leave. We reported this as soon as we found out that it was missing. We felt dispointed that we have to wait for few days to get response and even when we are about to leave, they said they didn't find it. We told them impossible not to find it if the housekeeping did her job well. We are very disappointed. Up until now We are still hoping we could retrieve it. We are still hopeful and waits for their update. Hope Citadines treats his customer with good after service. My child went home with a broken heart. We are hopeful that we could retrieve it. I like Fidel the receptionist in the lobby was very helpful and assisted us when we are about to leave. the whole room is on the small size, toilet had no comfortable space around it, seemed like stuck in a corner. Price is abit high for the size of the room. Garage was not really the best one, especially the exit did not look safe. And the exit from the garage gate to the road is not advisable for cars with low clearance as they are literally scratching the road with bumper and bottom. Really nice location, walking distance to Eiffel tower, shops, supermarkets and restaurants and bars and pharmacies are just a few steps away. Staff was very polite and helpful. Garage is available for guests for 30 eur/ day. The room was very clean and had everything you would need for a short stay. There was a small fridge with freezer, a small dishwasher, a cooking surface (we did not use it though, but there was a frying pan and a pot available for cooking), iron in a perfect condition, a set of plates and utensils for 2 persons. Sufficient light in the room and bathroom. Everything was good and clean. The hold room was very comfortable for kids n us and outside fresh air was coming in thanks to the balcony. The parking! Very tiny, good for small cars, but really not for other cars, the cost of 30 euros per day is too much for what you have, moreover it is was so difficult to find a place, and so difficult to park! I won't come back here for that, thats a huge drawback for me, I always look for hotels with a parking in or near, but here its really not recommended for normal or big cars! Friendly and very helpful staff, clean and comfortable appartment, very good location, almost everything was perfect. Though I note its their policy. Cleaning daily should be part of oackage without a charge. The location to the Eiffel Tower was fantastic.